You are here: Home / Media Reviews / Help Children Make Friends, Feel Less Worried and Deal with their Feelings! Looking for a great resource for Parents and Teachers? 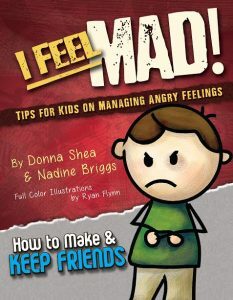 Best-selling authors and social-emotional learning experts, Nadine Briggs, Director of Simply Social Kids, and Donna Shea, Founder of The Peter Pan Center for Social & Emotional Growth, are not only in-demand for their work with children, but are themselves mothers of children with special needs. 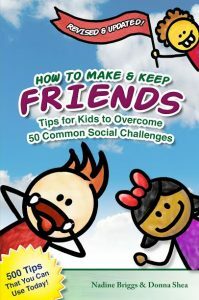 Aimed at helping children and parents address childhood anxiety and other social-emotional challenges, they have co-authored the How to Make and Keep Friends Series, which includes their practical and enormously helpful new book/workbook, I Feel Worried: Tips for Kids on Overcoming Anxiety. 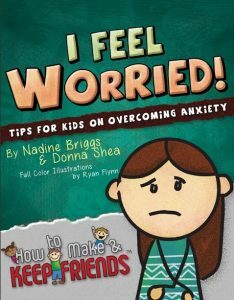 The workbook acts as a self-help guide to learn what worry is, how to identify and manage it by providing a variety of take-away tips, strategies and activities that kids, parents, teens, teachers, counselors and other adults that work with children can easily remember and implement. I like that it can be used for all ages! I love how helpful and insightful these books are and they can all be found on Amazon.com. This is a wonderful series for young children! Self Disclosure: I received free copies of the books to facilitate this post. Photos were provided.